L and Light's ....................... WEDDING?!?!. *GASPS* =O. 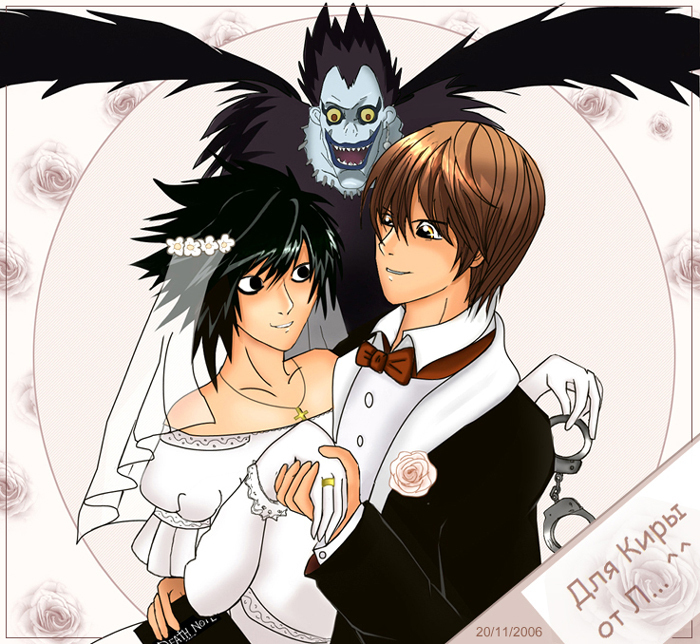 Wallpaper and background images in the Death Note club tagged: death note death note light l deathnote anime wedding ryuk. *laughing so hard I'm crying!*XD!!!!!!!!!!! lol. they should have a rainbow. Nouuu !! Poor L !! It's ok he gets on well with Raito, and between them there's something romantic, but L is not a girl !! lol If you don't get it Me+L+Marriage=Babies!!!!!!!!!!!!!! Why is L always the girl? Why is L holding handcuffs behind Light's back?